compiled from several sources While most of the universe was oblivious, a rather frightening drama has been unfolding on our sister trail, the Appalachian Trail. On Tuesday, Ken Knight failed to meet his hiking partners, and then Wednesday did not appear in time to catch his flight back to Michigan, where he lives. It turned out that no one had seen him since last Sunday. An official search began on Thursday. Friday, several members of the popular "greatlakeshikes" email group flew to Virgina to assist the Search and Rescue teams in looking for him. 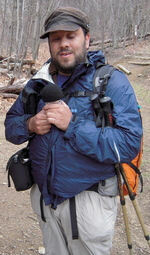 Ken Knight's regular job is as an editor for Backpacking Light magazine, and he produces "The Wandering Knight," a series of podcasts. Ken is an experienced hiker, even familiar with this section of trail, however he is visually impaired. It is assumed that this contributed to his becoming lost. He has hiked many miles on his own. It was this experience that gave people hope that he would be located. This afternoon while the searchers were scouring the woods, local firefighters spotted a brush fire and responded. They found Knight had set the fire in hopes of attracting attention. He was slightly dehydrated, but walked out of the woods under his own power with the firefighters. A very welcome end to this story. And we certainly wish Ken the best! Meanwhile, Nimblewill Nomad has been having an adventure on the Kekekabic Trail which illustrates the serious nature of a hike at the wrong season. Sheer determination carried him through the Minnesota northwoods to Heston's Lodge. After some self-recovery, he has decided to skip to Two Harbors, and return to the Arrowhead later in the season after the snow has melted. His journal reports: "It's really hard to say if I've gotten lost any given time today, or if I've even been off-track the least bit. Places like, say, above Seahorse Lake and by Chub River, more than not, there simply is no trail, an occasional, piddly two- or three-rock cairn, a scrap of flagging underfoot, or the guess at a blowdown sawcut--that's it. In these places, and as I search intently, there's nothing to be seen but brush, rocks and char, nothing else, no tread, certainly no evidence that man has ever set foot here." Yet this is a section that has been cleared by the Kekekabic Trail club several times since the blowdown of 1999. I personally participated in one of these trips to that exact section. It's quite eerie to know that someone, just a few years later, can't tell that we were ever there. Nimblewill also wrote: "Through the Kekekabic Lake area I'm in the thick of the storm devastation. The going is incredibly slow, and the tread has become more faint. To stay on trail I must constantly look for axe or saw evidence. More often now, that's the only sign. In many places there is no tread. Also, today I am faced with some very scary stream fords, what with the snowmelt runoff at near full tilt. My feet get hardly a moment's rest from the ice cold water." By the time he reached Heston's his feet were totally numb, he had fallen and twisted a knee, broken a hiking stick and the snow was still two feet deep. He is hoping to not have permanent nerve damage to his feet. These experiences should remind us that going to the woods is a serious undertaking even on a well-traveled trail like the AT, or the NCT, which most people assume to be very tame. I personally find these stories particularly riveting this week as I am packing food to leave for a hike of the area Nimblewill has just found so challenging. I am hoping that the 10 days between his experience and mine will eliminate most of the snow. But let's all take a lesson for heading out on the trail. Being prepared and making good decisions can certainly mean the difference between life and death.